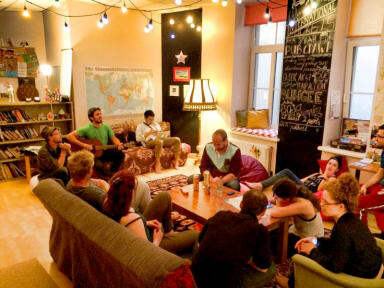 COZY, CLEAN and SOCIABLE Backpackers hang out. The right choice for small groups and individual travelers as well as for hostel hire-out for bigger groups. Extra comfort female dorm for the girls! Free toast and jam in the mornings, tours, beer and cider for sale, lots of local advice. !!! NO GUESTS UNDER 17 YEARS ARE ALLOWED IN THE HOSTEL !!! vezde vse tsisto, atmosfera ujutnaja. idealnoje raspolozenie hostela v tsentre. personal obshitelni i dobrozelaterlni. po vsem porametram / vishaja otsenka 10 ballov.